ATG’s selection of hammer highlights over the past week also include a German Neo-Expressionist painting and a set of Victorian photogenic drawings. 'The Tomb of Esther and Mordechai, Hamadan, Iran, with the Alvand range of the Zagros Mountains in the distance' by Charles-Théodore Frère sold at Bonhams. AR Penck is one of many pseudonyms of Ralph Winkler (1939-2017), a German Neo-Expressionist artist and jazz drummer. 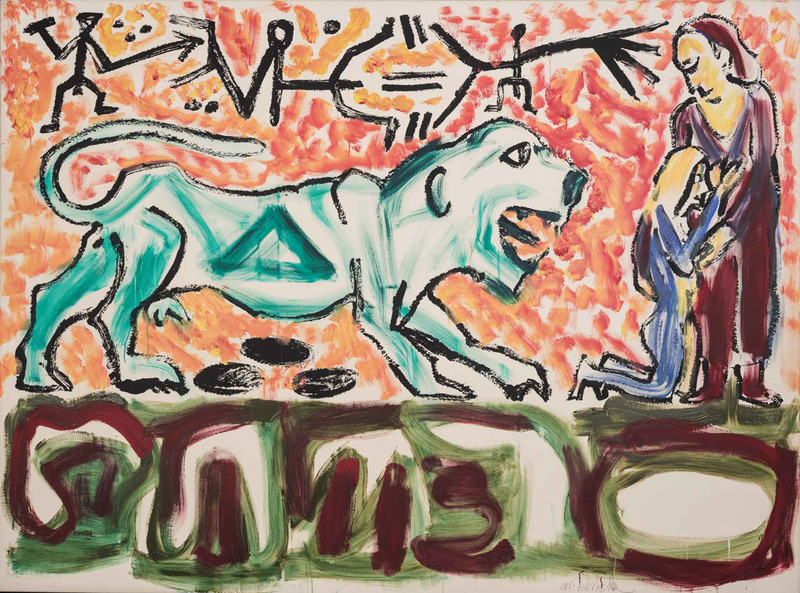 Living in Communist East Berlin, Penck was unable to exhibit his works freely but managed smuggle his pictures out to West Germany and Switzerland. He received enough acclaim to provide him with some protection from the East German authorities, until he was able to escape and settle in London. Colosseum, a large signed acrylic over silkscreen on canvas dated 1990, 5ft 10in x 7ft 10in (1.8 by 2.4m), sold for Zar260,000 (£15,000) at Stephan Welz & Co in Cape Town on February 4 via thesaleroom.com. 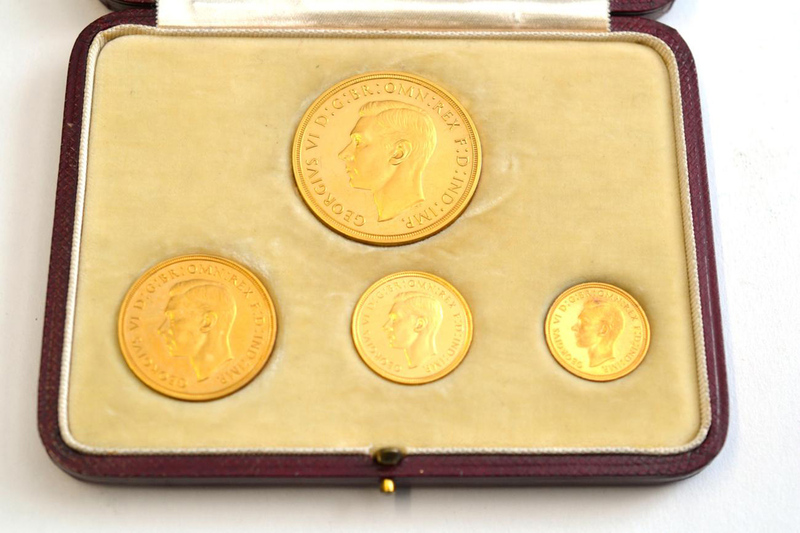 This George VI 1937 gold proof – four coins from five pounds down to half sovereign in fitted case of issue – sold for £8000 at Tennants of Leyburn. This George VI 1937 gold proof – four coins from five pounds down to half sovereign in fitted case of issue – sold for £8000 at Tennants of Leyburn on February 6 via thesaleroom.com. This was one of the 5001 struck in 1937 – the bust modelled by Thomas Humphrey Paget (1893-1974) whose initials appear to the coins with Benetto Pistrucci’s George slaying the Dragon to the reverse. The set includes the only sovereign and half sovereign’s struck during George VI’s reign. This 6in (16cm) casket was probably made in the mother-of-pearl workshops of Gujarat in western India about 1600. 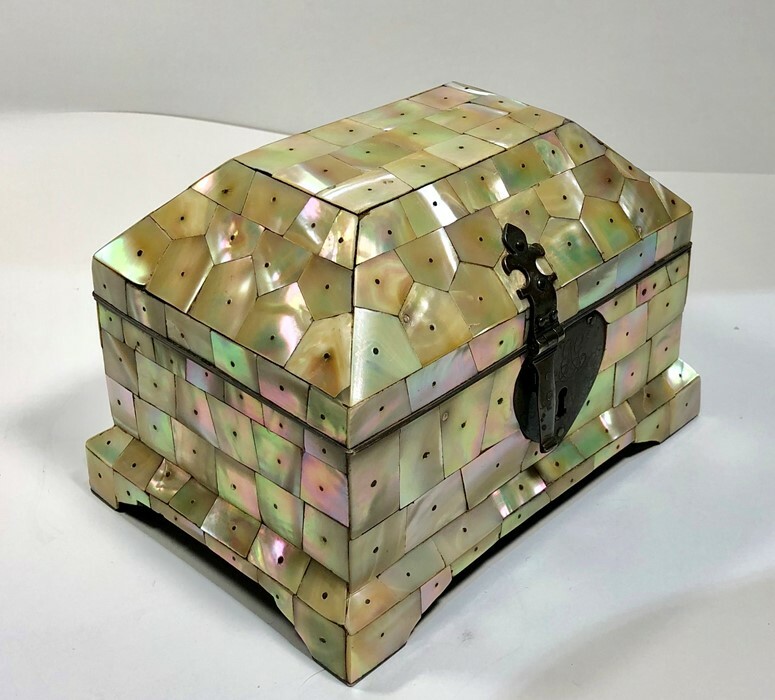 This 6in (16cm) casket was probably made in the mother-of-pearl workshops of Gujarat in western India about 1600. At that time, Gujarati mother-of-pearl articles were being made for local consumption as well as for different export markets, including Ottoman Turkey, the Middle East and Europe where mother-of-pearl were highly prizes. It sold for £7200 at Sutton Hill Farm County Auctions in Broughton Astley, Leicester on February 1 via thesaleroom.com. This collection of photogenic drawings were sold at Lyon & Turnbull. 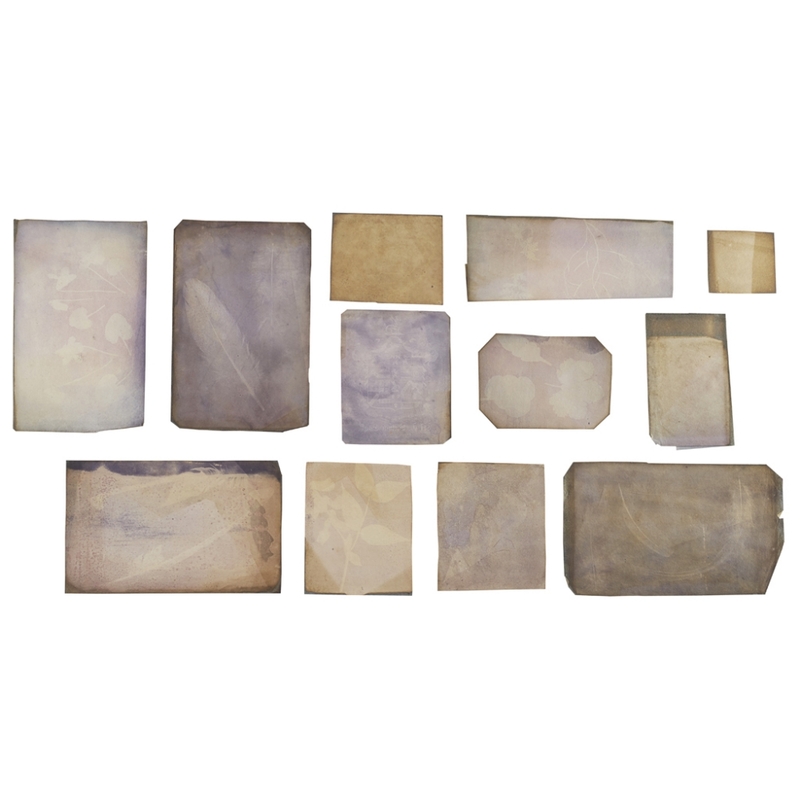 Photogenic drawing, first conceived in England by William Henry Fox Talbot in 1834, was the first photographic process capable of producing negative images on paper. The drawings were produced by placing flat objects (plants, fabrics, drawings or manuscripts, etc. ), directly on light sensitive paper. Talbot did not present his discoveries to the Royal Society until in January and February 1839. It seems likely that William Thomas Salvin (1767-1842) or his son of the same name (b.1808) was present at the lecture as he produced these images at Croxdale Hall in Co. Durham in April and May 1839. The various prints, some creased and three totally faded, are annotated with titles such as Magpie feathers May 1839 W. Salvin. Offered by Lyon & Turnbull in Edinburgh on January 31, they were estimated at £2000-3000 but sold at £4800 via thesaleroom.com. Among the lots at Bonhams’ Travel and exploration sale on February 6 was this rare early view of Iran. 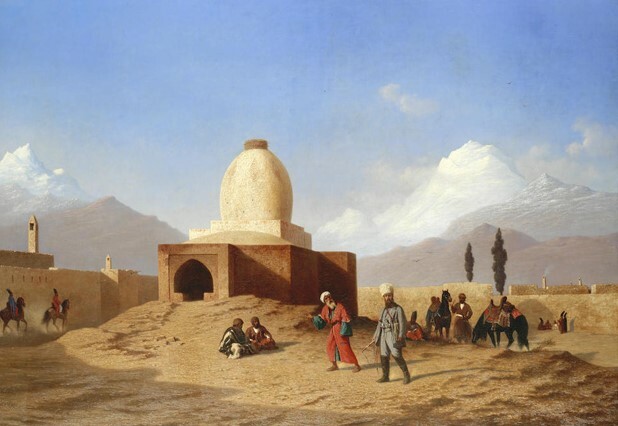 The Tomb of Esther and Mordechai, Hamadan, Iran, with the Alvand range of the Zagros Mountains in the distance by Charles-Théodore Frère (French, 1814-1888) was commissioned by John Osmaston who embarked on a trip around Europe and Asia after being grief stricken following the death of his wife during child birth in 1860. He recorded his journey, made on horseback, and was clearly impressed with the city of Hamadan. Although Frère built his career as an orientalist painter, he didn’t make it as far as Iran and this work is based on sketches and descriptions by Osmaston. The painting, passed by descent to the vendor, made the cover of the auction house’s catalogue and was hammered down at £38,000, above its £20,000-30,000 estimate.